General Information: The strong, indeterminate vines of this heirloom bear huge, beefsteak-type, slicing tomatoes that ripen toward the end of summer. 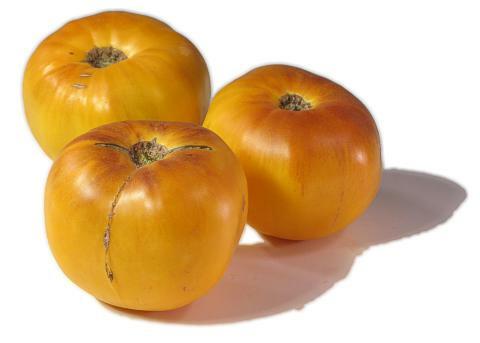 The lovely, peachy-orange colors of the Persimmon Tomato deepen from its softly dented, light green shoulders to the bottom of its plump, globe-shaped fruit. A dependable variety even in cool summers, Persimmon�s vigorous plants produce one to two crack-resistant fruits per cluster. It is the perfect slicing tomato because it has a small seed cavity and is solid and meaty with a wonderful, rich, fruity flavor. For colorful platters of fresh mozzarella, basil and tomato salad, layer these persimmon-colored slices with purplish-red Black Russian and watermelon-red Brandywine and drizzle with herbed vinaigrette.